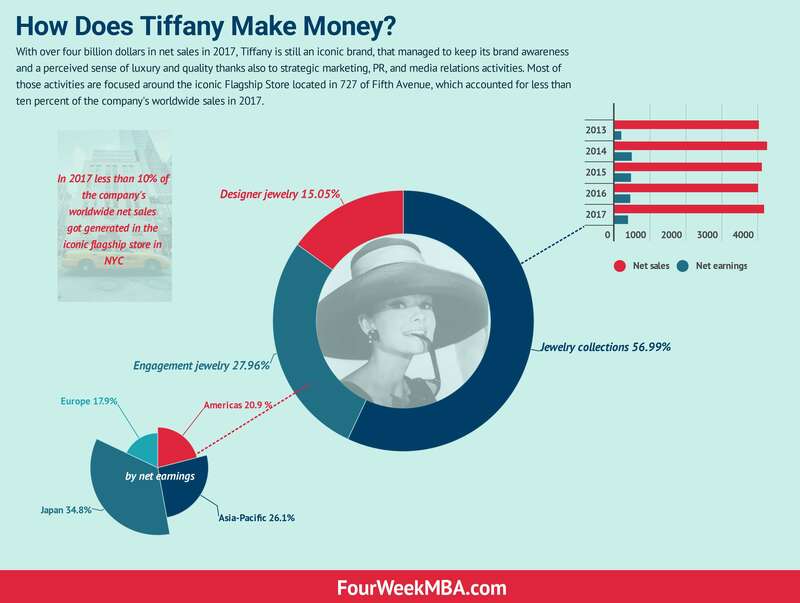 With over four billion dollars in net sales in 2017, Tiffany is still an iconic brand, that managed to keep its brand awareness and a perceived sense of luxury and quality thanks also to strategic marketing, PR, and media relations activities. Most of those activities are focused around the iconic Flagship Store located in 727 of Fifth Avenue, which accounted for less than ten percent of the company’s worldwide sales in 2017. Jewelry represented 91%, 92% and 93% of worldwide net sales in 2017, 2016 and 2015. Tiffany’s brand has managed to keep its iconicity for decades. Today the company still invests massive resources in marketing and PR programs to maintain and enhance its brand awareness. The critical association that Tiffany tries to establish in the mind of its customers in the sense of luxury. That is not by change that Tiffany silver products cost way much than any other competitor. Thus, Tiffany has been able to create this powerful sense of luxury and quality in its customer’s minds. Other key activities are about creating new product offerings and engaging in-store and online environments. Tiffany is also working on a multichannel strategy that together with print media leverages on digital and social media. A key ingredient for Tiffany is represented by its ability to maintain control in its supply chain by leveraging on internal jewelry manufacturing and direct diamond sourcing. For instance, Tiffany manufactures jewelry in New York, Rhode Island, and Kentucky, which produces about 60% of the jewelry sold by the organization. The iconic store located at 727 Fifth Avenue, with about 45,500 gross square feet and its “The Blue Box Cafe” opened in 2017, are both a key ingredient to Tiffany marketing and public relations efforts. Sales in this store represent less than 10% of worldwide net sales. Next Next post: Dynamic Pricing: Is The Price Tag Legacy Coming To An End?